A teacher seeks answers from researchers and psychologists. “Why did you cheat in high school?” I posed the question to a dozen former students. My current students were less candid than Sonya. To excuse her plagiarized Cannery Row essay, Erin, a ninth-grader with straight As, complained vaguely and unconvincingly of overwhelming stress. When he was caught copying a review of the documentary Hypernormalism, Jeremy, a senior, stood by his “hard work” and said my accusation hurt his feelings. Cases like the much-publicized (and enduring) 2012 cheating scandal at high-achieving Stuyvesant High School in New York City confirm that academic dishonesty is rampant and touches even the most prestigious of schools. The data confirms this as well. A 2012 Josephson Institute’s Center for Youth Ethics report revealed that more than half of high school students admitted to cheating on a test, while 74 percent reported copying their friends’ homework. And a survey of 70,000 high school students across the United States between 2002 and 2015 found that 58 percent had plagiarized papers, while 95 percent admitted to cheating in some capacity. 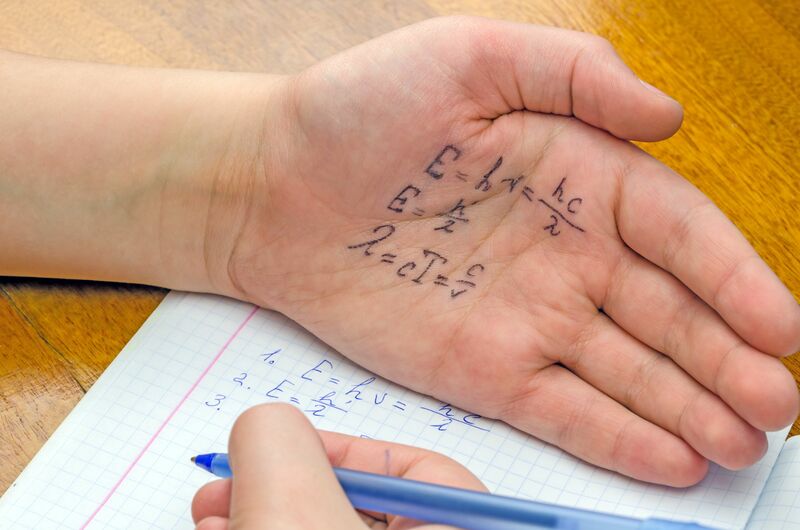 So why do students cheat—and how do we stop them? According to researchers and psychologists, the real reasons vary just as much as my students’ explanations. But educators can still learn to identify motivations for student cheating and think critically about solutions to keep even the most audacious cheaters in their classrooms from doing it again. First, know that students realize cheating is wrong—they simply see themselves as moral in spite of it. “They cheat just enough to maintain a self-concept as honest people. They make their behavior an exception to a general rule,” said Dr. David Rettinger, professor at the University of Mary Washington and executive director of the Center for Honor, Leadership, and Service, a campus organization dedicated to integrity. According to Rettinger and other researchers, students who cheat can still see themselves as principled people by rationalizing cheating for reasons they see as legitimate. Some do it when they don’t see the value of work they’re assigned, such as drill-and-kill homework assignments, or when they perceive an overemphasis on teaching content linked to high-stakes tests. But students also rationalize cheating on assignments they see as having value. High-achieving students who feel pressured to attain perfection (and Ivy League acceptances) may turn to cheating as a way to find an edge on the competition or to keep a single bad test score from sabotaging months of hard work. At Stuyvesant, for example, students and teachers identified the cutthroat environment as a factor in the rampant dishonesty that plagued the school. And research has found that students who receive praise for being smart—as opposed to praise for effort and progress—are more inclined to exaggerate their performance and to cheat on assignments, likely because they are carrying the burden of lofty expectations. When it comes to risk management, adolescent students are bullish. Research has found that teenagers are biologically predisposed to be more tolerant of unknown outcomes and less bothered by stated risks than their older peers. While cheating may not be a thrill ride, students already inclined to rebel against curfews and dabble in illicit substances have a certain comfort level with being reckless. They’re willing to gamble when they think they can keep up the ruse—and more inclined to believe they can get away with it. Cheating also appears to be almost contagious among young people—and may even serve as a kind of social adhesive, at least in environments where it is widely accepted. A study of military academy students from 1959 to 2002 revealed that students in communities where cheating is tolerated easily cave in to peer pressure, finding it harder not to cheat out of fear of losing social status if they don’t. Michael, a former student, explained that while he didn’t need to help classmates cheat, he felt “unable to say no.” Once he started, he couldn’t stop. According to a survey of 70,000 students across the United States, 95 percent of students admitted to cheating in some capacity. With smartphones and Alexa at their fingertips, today’s students have easy access to quick answers and content they can reproduce for exams and papers. Studies show that technology has made cheating in school easier, more convenient, and harder to catch than ever before. To Liz Ruff, an English teacher at Garfield High School in Los Angeles, students’ use of social media can erode their understanding of authenticity and intellectual property. Because students are used to reposting images, repurposing memes, and watching parody videos, they “see ownership as nebulous,” she said. As a result, while they may want to avoid penalties for plagiarism, they may not see it as wrong or even know that they’re doing it. This confirms what Donald McCabe, a Rutgers University Business School professor, reported in his 2012 book; he found that more than 60 percent of surveyed students who had cheated considered digital plagiarism to be “trivial”—effectively, students believed it was not actually cheating at all. Even moral students need help acting morally, said Dr. Jason M. Stephens, who researches academic motivation and moral development in adolescents at the University of Auckland’s School of Learning, Development, and Professional Practice. According to Stephens, teachers are uniquely positioned to infuse students with a sense of responsibility and help them overcome the rationalizations that enable them to think cheating is OK.
1. Turn down the pressure cooker. Students are less likely to cheat on work in which they feel invested. A multiple-choice assessment tempts would-be cheaters, while a unique, multiphase writing project measuring competencies can make cheating much harder and less enticing. Repetitive homework assignments are also a culprit, according to research, so teachers should look at creating take-home assignments that encourage students to think critically and expand on class discussions. Teachers could also give students one free pass on a homework assignment each quarter, for example, or let them drop their lowest score on an assignment. 3. Create student honor councils. Give students the opportunity to enforce honor codes or write their own classroom/school bylaws through honor councils so they can develop a full understanding of how cheating affects themselves and others. At Fredericksburg Academy, high school students elect two Honor Council members per grade. These students teach the Honor Code to fifth graders, who, in turn, explain it to younger elementary school students to help establish a student-driven culture of integrity. Students also write a pledge of authenticity on every assignment. And if there is an honor code transgression, the council gathers to discuss possible consequences. 5. Bring honesty right into the curriculum. Teachers can weave a discussion of ethical behavior into curriculum. Ruff and many other teachers have been inspired to teach media literacy to help students understand digital plagiarism and navigate the widespread availability of secondary sources online, using guidance from organizations like Common Sense Media. There are complicated psychological dynamics at play when students cheat, according to experts and researchers. While enforcing rules and consequences is important, knowing what’s really motivating students to cheat can help you foster integrity in the classroom instead of just penalizing the cheating.